2 AND 4 WHEELS TO THE RESCUE! 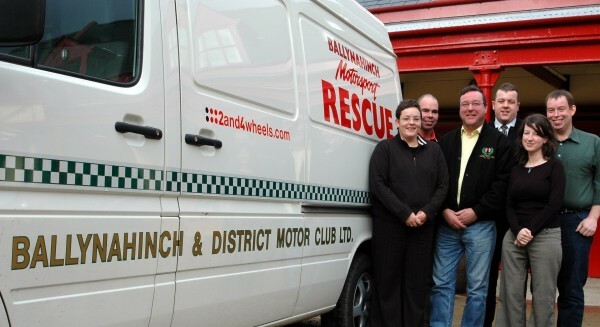 The 2 & 4 Wheel Motorsport Steering Group has given a grant of £3000 to help Ballynahinch and District Motor Club purchase a new rescue vehicle. It's a very welcome boost for the club and indeed for motorsport safety in Northern Ireland as this vehicle will be one that many competitors will see at the start of special stages all around the country. Rescue units are vital in all forms of motorsport, particularly on a rally special stage. These vehicles are expensive to purchase, equip and maintain, but they carry life saving equipment. They carry first aid equipment, extraction equipment, such as hydraulic cutters, electric saws and fire fighting equipment. They are in short supply to with only a few to cover the whole of Northern Ireland, and indeed such is the demand for these services that some units have to brought up from the South. Each unit is manned by at least two licensed operators, who have undergone two years of training in rescue techniques. Michael Marner from the Ballynahinch Motor Club is one such licence operator and he is in charge of clubs rescue services. "Basically we started about two and half years ago, as we noticed a great shortage in rescue units with only two covering Northern Ireland." After making the initial investments on the expensive equipment inside the vehicle the club this year were faced with the task of having to find more finance to update their rather worn Ford Transit. " We applied for the 2 & 4 Wheel Motor Sport grant, and thanks to that it has enabled us to purchase a more modern and most importantly more reliable vehicle" commented Michael. With thirty-nine events already been carried out by the Ballynahinch Rescue unit this year reliability is important, and the 2002 Volkswagen LT 28 that has just been kited out will hopefully provide that. It would be impossible to run motorsport events without such equipment and expertise and for competitors it could be this vehicle that comes to your rescue. Pictured above are: Pippa Campbell & Louise McNicholl of 2&4 Wheels Motorsport Steering Group, David Meeke (BADMC Club Chairman), Brian Crawford (Vice Chairman), Michael Marner & Alex McClements (Rescue Personel).